Oh look! A fabulous extra-hefty board book (32 pages!) for the littlest little kids. 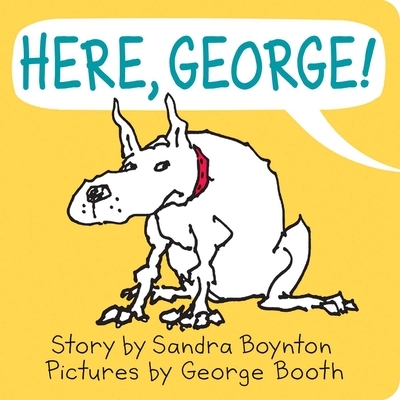 Beloved bestselling author Sandra Boynton collaborates with iconic New Yorker cartoonist George Booth to create this hilarious new book about George, a lovable dog with a big secret. George is a big dog who likes to just sit around. But there’s another side to George that even his family doesn’t know about. With Sandra Boynton’s whimsical storytelling, and celebrated cartoonist George Booth’s one-of-a-kind illustrations, Here, George! is a sweet, quirky, and charming board book that’s a must-have for every collection! Renowned cartoonists Boynton and Booth team up for a delightful day in the life of canine George. This white dog lives a sedentary life and prefers to sit and sport a sour grin as members of his family beckon him one by one. With the exception of who's calling, the first several pages are identical: "HERE, GEORGE!" says a voice. But "George does not move." However, after they leave the pooch on his own, he hears some music and gets up to dance Snoopy-style through a full double-page spread. When his humans return, they find George in the exact same position as they left him—but with some fond memories that summon a wag from "his happy tail." Boynton closes the work with the clever aside: "And he is wild about dancing. (Which no one knows but you)." Booth's iconic cartoon dog, made famous in the pages of the New Yorker, is constructed with a fluid and endearingly shaky line. He masterfully registers a change in mood with a simple upward flick of a cartoon grin or a sideways glance. Boynton's text is a simple and playful complement, rendered a stand-alone visual element by the decidedly Booth-ian faux handwritten typeface. It's a one-joke book, but with such master humorists at work, who needs anything more? Readers are let in on a secret in this story of a white dog that appears to spend much of his time perched on his knobby haunches and staring. When George’s family calls to him—“Here, George!”—George stays perfectly still: “George does not move.” After watching “the man and the lady and the child drive away” (they never appear on the page) and taking a nap, George perks up at the sound of distant music. Unexpectedly, “now George is dancing. And dancing. And dancing.” Once George’s family comes home and calls out to him, Boynton and Booth return to the previous formula: “George does not move, except for his happy tail.” New Yorker cartoonist Booth demonstrates his keen sense of the comedy to be found in contrast, as George goes from being nonresponsive and glum to kicking up his heels when no one is watching.